Marriage: it’s why we’re gathered here today. It only makes sense that the most common of lyrical subjects, love, would see its supposed apex, the wedding, represented time and time again in popular song. But two’s company, three’s a crowd and rarely is a wedding simply about just the folks getting hitched. Otherwise, why bother asking if anyone objects to the union? At two bookend points of his career with the Replacements, Paul Westerberg tackled weddings from the perspective of a man in the audience who is an ex of the bride-to-be, and looking at the difference between how each narrator approaches the situation is a lesson in the growth of a man. 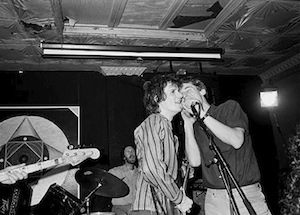 “You’re Getting Married,” a demo that officially surfaced on last year’s reissue of the 1982 EP Stink, is typical of songs like “If Only You Were Lonely,” “It’s Hard to Wave in Handcuffs” and other Westerberg demos that were often considered too sentimental for recording by the band. Heartache and resentment ring throughout the song’s lyrics as Westerberg insults the groom by calling the woman a “guitar in the hands of a man that just can’t play” and insisting that she’s missing out on something by calling her “a bird in a cage watching the flock fly on by” and “a flower in the dark / you ain’t never gonna bloom.” He ends the song with the plaintive plea “don’t you get married, no, no, no.” He seems petulant – he repeats the “guitar” line from earlier, only calling the man “some fool” this time – and full of the vinegar of a person still bleeding from emotional wounding. “Nobody,” however, from 1990’s All Shook Down, is a more detached and observational look at a wedding the narrator thinks shouldn’t happen. The hints of his involvement are more subtle (“double takes / as they look my way”) and mostly he seems to be cataloging the proof that the bride isn’t ready for this. “Knees quake / there ain’t a shotgun in the place…your eyes can’t fake / still in love with nobody.” But the song slowly reveals its meaning as the identity of the owner of the “heartaches / on your wedding day” in the opening line becomes more ambiguous. What first seems like a simple statement of being unready for commitment (“[you’re] still in love with nobody”), develops into a hovering presence of lingering love when Westerberg reveals himself as the “nobody.” “Take a look on your wedding night / in your wedding book / see what name I signed.” He watches the bride and groom leave, but he knows he’s made his point. I have a different take of “You’re Getting Married,” downloaded from audiogalaxy ten years ago. Frankly I have no idea where it’s from. It goes right into the “Don’t Get Married” plea right at the beginning and I believe it was recorded at the bottom of a well. Damn fine post. “You’re Getting Married” is just devastating. “$100 Groom” from his solo album, Folker, is a good one, too. His revisiting of themes throughout his career is what makes him so god damned interesting. Johnny’s Gonna Die to Devil Raised A Good Boy is another interesting journey too. Two brilliant tracks. I saw you mentioned “It’s Hard To Wave in Handcuffs”. Any chance of posting that and those other solo tracks? They’re great and I haven’t heard them in years since I lost the cassette I had with them on it. Very late to this but I think what is called the “petulance” of “You’re Getting Married” is not that. It’s more complicated. The line “you’re like a guitar/in the hands/of some fool who just can’t play” is self-reflexive. That is, the track is just PW and his guitar, and in parts (especially at the beginning) he’s playing pretty sloppily. We can’t not think of the fool who can’t play as different from the singer (especially if we’re used to PW’s habitual self-deprecation). So the fool is not the groom. It’s the singer himself, who is acknowledging his own awkwardness and upset, and comparing these to the awkwardness of her about to enter a state she doesn’t belong in. The awkwardness of the singer, in addition, could be a clue as to why things didn’t and can’t work out between singer and addressee.